Which really is more just an admittance to myself then an actual confession. Have already seen “it” but either I have been blind by the truth or tricked into thinking that I too could be super mom. The super mom myth is just that. A big fat lie created to make normal everyday moms around the world feel like crap. “You too can have a spotless house, well behaved children and a fantastic marriage” all you have to do is… Sound familiar? All the magazines would lead you believe that behind your neighbours closed doors perfect ikea bedrooms lie mocking your unmade bed. Somehow I started believing that it was possible to live like that if I just tried a little harder. So without even realizing it I swallows the lie hook line and sinker which translated into burning the candle at both ends. Menu planner, chef,event coordinator, housekeeper and chauffeur took priority over my life. I put my knitting aside and put the books away busying myself with every day household stuff and not taking a chance to rest. I have my kids in so many activities It wasn’t until one of the ladies at bible study pointed out my error in counting how many activities they are actually in! Just so you get “on the same page” I’m a mom of 4. My oldest is 18 so she is the independent one out of the crowd. Then I have an 8 year old son a 6 year old daughter an a 2 year old daughter. Plus my hubby works out of town for 10 days at a time to support our family so there are days when it’s just me and the kids and truthfully it’s it can be tough. I work too in the house running a day home watching 3 additional children Monday to Friday 7:00-5:00 along with working at the church nursery Tuesday mornings from 9-11. That in itself should be more than enough but ever night the middle two have 30 min of home reading and 30 min piano practice. I have stuffed our lives so full we haven’t scheduled any rest or downtime. This schedule is set in stone until the end of December. Sometimes we get so caught up in all of our “junk” we don’t even see the signs that we have over committed ourselves and over extended ourselves. I never developed Unhealthy boundaries telling me when to stop which is hard because I love what I do! I knew I was tired and I am tired but this is ridiculous. It takes me getting a fever to unplug for an afternoon and snuggle under a blanket to rest. We were challenged in study to make changes in our daily schedule that would give even a few moments of much-needed downtime. 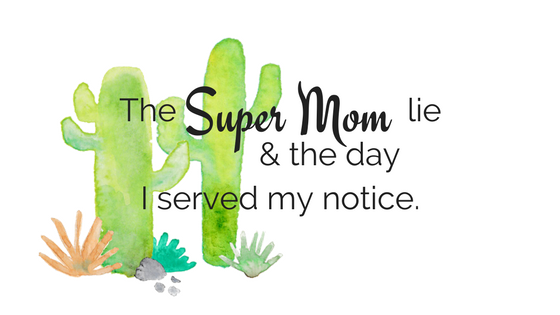 Part of the super mom lie is somebody else has already bought into it and they believe that you can do it and that person will always encourage you to continue on with all the craziness or to add more to your plate. Even if they don’t try for themselves. You have to ignore her. Seriously I don’t care who she is or how wonderful her chicken pot pie is. Being a mother to a large family is tough. Sucking up the lie that your house has to be spotless is exhausting and pointless. Do you have any idea how much Landry a family of six can generate in a matter of days? I’m convinced the dirty underwater is multiplying but I can’t find definitive proof. Yesterday alone I washed and dried six loads of laundry. You would think that the basket would be empty but I peeked and to My horror I realized I have another load just waiting to go in. I learned that It’s okay to order “take out” and take the night off cooking. It’s okay to sit and play a board game and heaven forbid let your house look lived in. Supermom will tell you that you can do all of “it” but I’m a real mom and I’ve learned the hard way so believe me when I encourage you to delegate. if they’re old enough to pull the clothing out of the drawer then they are old enough to put it back in. If you are concerned that the clothing won’t look as neat and tidy as you would do it then show them how to do it once and then resolve to the understanding that yes,a small bomb blew up in that drawer and and it’s wise to it just not look! A few household chores have already been delegated so that the kids pick up their own toys and make their beds. They empty their backpacks and lunch kits which frees up time. The six-year-old enjoys vacuuming so I relish the help when offered. I have yet to see anyone perish because there was dust on the tops of door frames and the only one who cares about that must be crazy. I’m learning that it’s okay to not give an automatic yes. I’m also realizing I’m in desperate need of a break. How that will translate into my every day life I don’t know. But I tried something different the past two mornings. I woke up, brewed a cup of coffee and sat down with my bible. The Lord has been impressing on me to read a chapter each and every day from the book of proverbs. If you aren’t familiar with this particular book in the bible it was written by Solomon the wisest king to rule Israel. This book gives practical counsel that’s also spiritual ranging in issues from money management to the dangers of adultery to learning how to identify true friends. Hidden in these words are principles of building strong marriages, parenting and relationships. Believe it or not two days in and I’ve already noticed huge difference. I still have a mountain of stuff to do but when I put him first the other stuff just sort of falls into place. I’m also in the process of changing my own expectations of what needs to be done what doesn’t need to be done in the course of the day. I’ve also learned that it’s okay to turn off the phone curl up with a good book and read. I’m making time to just get some rest. I’m giving notice and hanging up my super mom cape. Don’t buy into the lie!! This is great! We all feel that pressure and deciding to let it fall away and enjoy life is so freeing! It’s nice to be able to stop trying to do everything for a while. Having help doesn’t hurt either. We’re only human! Unhealthy boundaries – oh my goodness yes. I never put resolutions on myself and I am glad I didn’t. I dont want to overset myself and feel down if anything goes astray. Great post and insights into how you are feeling! I so agree with you! Supermoms only exist in imaginary virtual land! You’re not alone, Heather. I don’t think there are any moms out there who can do it all. I think it is a game of give and take. If your house is perfect, then there is something else you are taking away or not doing. I have a friend who seems to balance it all, but there is just no way one person can do it all. You’re doing the right thing to enjoy your little ones…As you know with your 18 yo, they grow so fast! You had TWO free nights – and one on a Friday? Wow. Nice schedule. I take it that is no longer the case? If you are getting sick, your body is probably telling you “I need a break.” We need a little peace and quiet. I hope you find that your schedule isn’t as “set in stone” as you believe it is. Yes. You may have to let some people down before December, but your health – and your family’s time – is more important than worrying about whether or not someone is disappointed. WOW I Got tired half way through your post. I am glad you realized super mom does not exist. I realized this a long time ago and it was the best thing to ever happen to me. Good for you for exposing yourself! A year or so ago, I felt the same and I just do what I can now. You are an amazing mom! I'm glad the lie has been exposed. As someone that has already raised my children…yes, being supermom is a lie!! Enjoy your kids while they are young….don't spend all your time just running in circles! Too many activities is not good either…for you or for them! When my daughter was younger, she was in a lot of different activities. I learned to give her a choice of three and at least 2 days of nothing! We learned to enjoy a lot of family time. It is very hard to take care of ourselves. The sad thing is that when the little ones grow up, we have to figure out who we are, again! Shoot, and I thought I had it rough because I home-school! I think you hit the nail on the head with the word 'expectations'. We put so many expectations onto ourselves, and I don't know about you but I then project them on others. My husband wants the 'perfect' wife and my kids want the 'perfect' mom when in reality they're happy to have me just the way I am. Excellent post. I used to think I could be a super mom until I realized it was just not possible. Something had to slide. And I felt a lot better when I realized that! To be honest, I have what some people call “The life” but inside I am far from perfect, and I am not trying to put up any facades! I feel you and I don't think that there will ever be a perfect balance in motherhood. I do think that it's important to be forgiving of ourselves – and give back to ourselves in ways that make us feel go. Thanks for sharing what so many of us feel. I have 3 kids and run my business from home – Yes, I'm a Super Mom. My floors are sticky, my dishes aren't done, I have yet to take a shower, and the laundry piles are taller then my youngest child. I am an amazing mom. The love in my kids eyes show me so. Been there, done that, got the t-shirt. I have five kids and at one point we had soccer, ballet and boy scouts all going along with homeschooling and church. When we moved to a different state, we decided to take a break from the extracurricular activities for a season to get settled and you know what everyone survived not being on the run all the time. We still homeschool and do church activities but we decided life is much nicer without the extra running. So it took moving for me to hang up my cape. Although we have decided to add homeschool gymnastics a couple days a week this fall. After reading that I am ready for a nap. You really are Super Mom. I also seem to spread myself too thin and this was a great post to bring me back to reality that I don't need to be Super Mom – just Mom. It's very easy to get sucked into thinking you should be able to do it all and that you can be a supermom. We all want to be the best we can at everything we do, sometimes we just need to realize we don't have to do it all. Wendy, Thank you so much for all of your encouragement!! The last few days I have been scheduling more and more “me time” trying to refocus and re-center. Hi, new follower from the hop. I can relate to the stress of trying to be Super mom! This past year has been so difficult for me, and even looking back on it, I think I was in zombie/survival mode for a lot longer than I thought I was (I thought I was doing fine, but I wasn't). Mommy-ing is such hard work! Making time to read is a big thing for me, too, I feel more human again with a good book! Wow! You sure have a full plate. What a good mommy. It is all worth it, I promise. Find your quiet time, each day, even if only for 15 minutes. You will feel renewed. Here from “I'll have what shes having”!